NOTE: This story originally appeared on GoEarlham.com on September 14, 2017. Noah Scherf runs in the shadows. He always has, and he always will. Which is why, no matter the time next to his name on a results sheet, there will forever be more to his story. 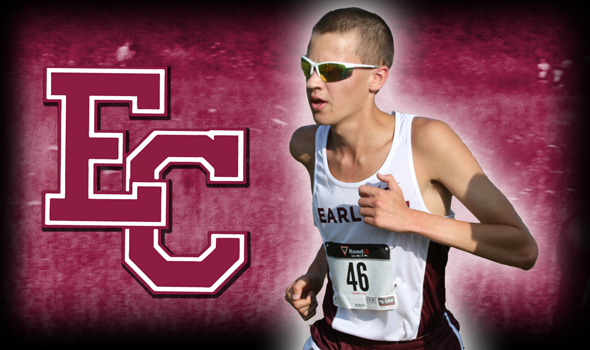 Scherf is a freshman cross country athlete for Earlham College. He is also legally blind, and has been since birth — a 1-in-10,000-chance victim of coloboma, which is a defect of both retinas. He can see someone close to him, but not in very much detail. He can read, but the words can’t be far away, and large type helps a lot. That’s him coming up the steps in the Wellness Center, in his special glasses, and the cane he uses to navigate the campus he is just learning about. Cross country. Think about that for a moment. There are turns and twists, and tree limbs, and roots and changes in elevation and holes in the ground, and he can hardly see any of them. There is some risk in every step. And still, he runs – pretty well, too, finishing sixth and fifth in the Quakers’ first two meets — so you wonder what competing, in this or anything else, must mean to him. "I’m tempted to say," he began, "that it means almost everything to me." "It levels the playing field to a certain degree. The playing field is a lot more level than other areas of life, obviously. Cross country is the most risky for sure, but also probably the most fun because of the risk. Overall, it’s just been a way for me to kind of be even with the other guys." We should mention his earliest sports, for the kid off a farm outside Michigan City. There were soccer and football. Soccer? Football? With seriously impaired vision? Yep. "It was interesting," he said. "I love football a lot. I’ve been watching it since I was little (with a vast Colts jersey collection). Nobody else in my family does, so I don’t know why I started." There were swimming and track – more manageable, because with lane lined lanes he could follow. There was even karate. "That was a lot of fun because you can work around it. If you know where somebody’s arm is, you know essentially where the rest of their body is." Bottom line: From the beginning, he would do what his heart told him to do, not his vision. If there is any truth to the old cliché, making lemonade out of lemons, Noah Scherf turns out the stuff by the gallon. This, for a young man whose Twitter name is Eagle Eyes – an ironic moniker to his followers, a defiant stick-it to fate. Or as Earlham Co-Head Cross Country Coach Rob Hewitt said, "He’s a headstrong kid who doesn’t want to be told, `You can’t do something.’ He doesn’t want to be coddled. He doesn’t want to be treated differently." It has been that way since Scherf can remember, in a world he has only known as mostly blurs. "In terms of mental strength you have to be able to just take a beating. I think from a really young age my mom and dad never treated me different. They let me play soccer and football. They were pretty open minded." "It’s definitely an interesting dichotomy to think about. There are things obviously you’re not allowed to do. Driving for example. And so it’s interesting to go up to that edge of what you can do, and you want to push it, but at the same time you have to understand there is a line here you probably shouldn’t cross." But that line never kept him from running. He won a gold medal in the 1500 and bronze in the 800 in this summer’s junior World Para Junior Championships in Switzerland – the biggest thrills of his life so far. And he was running well enough in high school for a recruiting phone call from Hewitt in the summer of 2016. Somewhere early in the conversation, Scherf got right to the point. "I need to tell you," he said, "that I’m blind." Now there’s a comment a coach doesn’t hear often from a recruit. The more Hewitt heard, the more he was intrigued. Earlham was interested, he told Scherf. Very. Flash forward to Scherf’s first visit, when he was invited to take a run with the team. Hewitt, fearful of his guest having a mishap, went along. "I’m making sure he’s safe. But he’s fine, he does 70 minutes with those guys, he’s happy as heck," Hewitt said. But there was an injury. A rolled ankle, Hewitt’s. So the match was made, and here they are. To hear of Scherf’s role as part of a promising freshman class in a blossoming program, one question naturally comes to mind. How can he do that, over a landscape largely hidden from him? "It’s because your best athletes are your best compensators. He’s able to build compensation systems for himself to survive," Hewitt said. That means Scherf making solid foot contact with each step. It means always trying to run with someone else, be it a teammate or an opponent. "I’m going to be reading mainly hips and shoulders, because that drives the body and that tells me a lot of things; elevation and turns and things like that," he said. "It’s just adapting. I would never get myself in a no-man’s land." And there is something else, said Hewitt. "I guess the easiest way to describe it is he has no fear. And if he did, he doesn’t tell anybody about it." No fear, then. But what about moments of anger? They’d be understandable, with the mountain Scherf always has to be climbing. He considered that a moment. He considers most answers, negotiating questions with the same care he does a cross-country course. "I don’t know if I’ve ever been there, because it’s not a productive line of thought. I’d rather spend my time doing something else, because it doesn’t change anything. Being mad about it doesn’t help it." Still, not a week, not a day, not an hour can be easy for Noah Scherf. That would include life as a college student. Academics bring even more challenges than athletics. "For sure," he said, "100 percent." The coaches, he mentioned, knew what they were getting into. But a blind student is very, very rare for the Earlham community-at-large to figure out how to accommodate. "They don’t really understand what to do, and that’s fair," he said. "It just takes a little time to work into it." The heavy reading that goes with classes is often a strain, and there is the simple task of getting around campus. "At the beginning was tough. If I had my way, it’d all just be a straight line. But I’m starting to figure stuff out. I still have certain ways I go places. I don’t like short cuts yet, that still throws me off." But he walks where he has to, and reads what he must. And he runs, because it is the one place in the world that is fairest to him. The stopwatch does not know who can see, and who can’t. All the while, his coach watches in wonder. "The one thing I would worry about him is stepping forward to tell us if he needs help. Because I think that’s going to be the hardest thing for him to navigate," Hewitt said. "He’s mapping a whole new campus, he’s mapping all new cross-country courses. He’s mapping all new training runs. He’s creating different interactions with people. Everything is just stimulation overload for him. But he’s a good kid and I think Earlham has good people, so I think it’s a good match. "He brings out a level in people that is pretty awesome. He’s the type of guy you’re going to look at and say, `Well I can’t really say I don’t have it today, because he is bringing everything he has, every day. Every time he runs, he’s on. Every time he’s in class, he’s on 100 percent, both mentally and physically. There’s no rest for him. That creates people who want to fight with him, and want to help him and want to be there with him." In a way, it is complicated for Noah Scherf. In another way, so simple. "It really just comes down to treating him in a way that makes him feel like he’s a part of this and he’s one of the boys," Hewitt said. "That’s what he wants. To be one of the boys."